The 4103M is a high specification, 100mm strip chart recorder, providing continuous recording for up to 6 Process Variables. Information such as Channel descriptor, alarm set point and scale information can be viewed on a high resolution VFD display. Process variables including messages can be archived to an optional removable media. These units can be programmed on site via the user interface or a configuration file can be transferred using a PCMCIA card. As well as displaying the process variables as a numeric value the 4103 also provides a bargraph indication. The display will cycle through PV’s configured to appear in the Display group. Additional information including the channel descriptor, scale information and alarm set points can be viewed using the operator key. The addition of the advanced maths pack option provides the 4103 with 16 derived channels and the ability to carry out complex calculations such as relative humidity and mass flow. Derived channels can be added to the log and display groups for trending and archiving as required. Two log groups are available for sending tabular data to the chart or PCMCIA card. Either log groups can be initiated to print on the chart. Log group 2 can also be archived to a PC Card automatically at predetermined intervals. 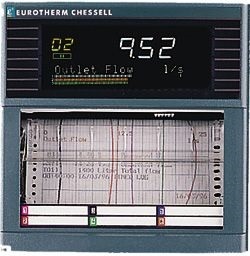 Data can be archived as either ASCII for use in spreadsheet, or Packed for viewing using Eurotherm Review software. At slow chart speeds it is possible that the input circuit, between chart increments will pick up a spike or other brief disturbance in the measured signal, but that this disturbance will not appear on the chart, even though they may trigger an alarm. With adaptive recording enabled, if a sudden change in the input signal is detected, the recorder will place an additional dot on the chart without the chart being moved. This means that even at the lowest chart speed, unexpected signal changes can still be traced. Offline printing and viewing is made possible by the use of the Review Software package. This package uses the packed data files from the recorders local storage media and imports them into a PC database. Data from one or more archive files can easily be viewed. This data can then be printed or exported as a CSV file. Review can also be configured to automatically Backup and Transfer the archived files via a modem. For continuous trace recorders the traces are separated in the time axis of the chart by 2mm, this results in simultaneous events being separated on the chart by 2mm. When enabled on the 4103M, Pen offset compensation applies a delay to the pens, the time delay being determined by the selected chart speed, such that simultaneous events appear on the same time axis.